ENDURO IS JUST LIKE TRAIL RIDING... RIGHT? Well sort of, except with a bit more structure, clock watching and urgency, and maybe a little less chatting. Essentially though it is about spinning to the top and then bombing back down as fast as possible which is what a lot of us do on the weekends. To really hone your enduro race training regime though, I believe you need to break it down into two sections and concentrate on improving both for an overall improvement in race readiness. I call them Economy and Strength. Economy is about being as efficient and economical as possible on the transitions which are usually dominated by climbs. This will mean that you hit the stage with plenty of gas in the tank and you can put in more effort for race winning times. Nobody wins an enduro on the climbs, but many people lose a race there by being totally wasted by the time they reach the start of the next stage. Economy therefore, is pretty important. Strength is about being robust enough, strong enough and powerful enough to fully commit to the rigours of the stages which are often basically DH tracks, just on smaller bikes. To hit this terrain hard, fast and committed 5 times in a day requires full body strength. This is arguably the easiest of the two parts to train. Ideally you want to be able to make the transitions at as low a heart rate as possible, therefore expending less energy and feeling less fatigued. There are not too many short cuts to increased economy and the best way to improve it for most people is longer, steady paced rides at quite low intensities throughout the winter. This can be done on a road bike or MTB, and the focus should be on gradually increasing the durations of your rides and keeping in Zone 1 or 2 for HR or power. 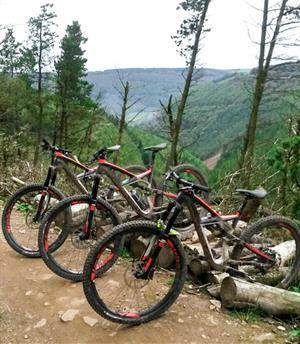 Typically a round of the UK Gravity Enduro series sees you riding 30-40 km on the Sunday and climbing about 1500m. You should aim to exceed that in your training so you know that you are capable to doing the loop comfortably. To make yourself more efficient with the use of your bodyâ€™s stored glycogen (carbs stored in your body) you can practice riding in a fasted state or with little or no carbohydrate ingested prior to riding. (At your own risk - beware of bonking!) This will have the effect of training your body to run on fat as a preferred source of fuel at low riding intensities, saving your glycogen stores for when you need it on explosive stages and improving your energy economy on the climbs. You will obviously need to spend time climbing hills in your training as well. Vary the speeds of your climbs in training, trying to do some hill repeats at high intensities, some at roughly race transition pace and some in Zone 1 or 2. Make sure that some of this training is done on your race bike and not all just on a road bike as you will need to look at your setup. If you have a slack seat tube angle then you may want to put your saddle forwards on the rails to improve your seated climbing position for instance. Race day is not the time to mess around with this stuff, so experiment now and get your setup dialled-in. You may also want to think about how you are going to carry your kit and water. Systems like the new Specialized SWAT give you plenty of versatile options that may mean you can ditch the pack on shorter races, making you lighter and therefore more economical. Finally, you will need to look at your power to weight ratio which is crucial for climbing. To improve it you can clean up your diet and lower your body-fat making you lighter or improve your pedal power through strength training. Preferably you will do both. Reducing body-fat is a whole new article, but focus on eating real food and cutting down on sugar and junk. Strength training should focus on whole body exercises like the squat and deadlift performed with perfect form under heavy loads, but we will talk more about this in the Strength section of this article. If you are new to this type of training then I would suggest hiring a good quality coach to help you out. These are not easy exercises to learn from books or the internet! For most riders, strength is the missing part of the training jigsaw. If you are weak, you canâ€™t reach your true potential, no matter how skillful or natural on a bike you are. You should look to build whole body strength through the winter months, add in power training in the spring and then work to maintain your gains over the race season or summer. Modern enduro tracks and trail centre descents can be pretty demanding to hit at speed, so it is important to be physically prepared for the hits and to be able to move the bike around easily. As mentioned earlier the key here is to work your entire body, using what are known as â€˜compound lifts.â€™ These are whole body moves and the exact opposite to isolation exercises and machine based training which tend to focus on only one or a few muscles. When you plan your training, you should try and do 2 or 3 whole body sessions per week to build strength through the winter. Never split your training into leg day, chest and tricep day etc. You are not a body-builder! This training does not have to be over complicated. In fact, simple is usually best. If in doubt try and cover all of the following types of movement each week. Examples shown for each to give you some ideas. Squat - Bodyweight, single leg, goblet, front, back, overhead. Hinge - Deadlift, swing, Romanian deadlift. Push - Press up, press. Pull - Rows, pull ups. You may also benefit from things like loaded carries (carrying heavy stuff) and also some conditioning sessions to build your work capacity and prepare you for intense race stages. The most important thing is to do the exercises properly and that may mean under supervision to get you started. Donâ€™t rush and donâ€™t let your ego take over when you are selecting what weight to use. Long term consistency in training always trumps short term intensity. To support your strength training, make sure you are doing mobility work and stretching and that will help to keep you moving freely and injury free. By bringing all of this together you can build your own training programme for enduro racing that will address all physical parts of the race. Now you just need some amazing skills on your bike and you will be on the path to victory! Ben Plenge is a strength coach and mountain biker based in Bristol. He started Mountain Bike Strength Factory in spring 2014 in order to train riders of all levels and across all disciplines of mountain biking. Ben loves riding bikes, training in the gym and taking trips in his camper van and now works full time training his athletes. MTB Strength Factory offers online programmes, distance coaching and one to one packages for all abilities, right up to World level riders with the highest goals.